In a large pot or Dutch oven melt 2 tablespoons of butter over medium heat. Once butter is melted add bell pepper, onion, and celery and cook for about 5 minutes or until onion is soft. Add the garlic to the vegetables for the last minute of cooking. Add the chicken stock, cayenne pepper, Worcestershire, parsley, okra, and salt and pepper. Bring mixture to a boil and then reduce heat, cover, and simmer. While mixture is simmering add sliced sausage to a skillet and brown. Once browned, remove sausage from pan with a slotted spoon and add to chicken stock mixture. Discard remaining sausage drippings from pan then melt 6 tablespoons of butter in the pan. Once melted, add 6 tablespoons flour and whisk until roux is incorporated. 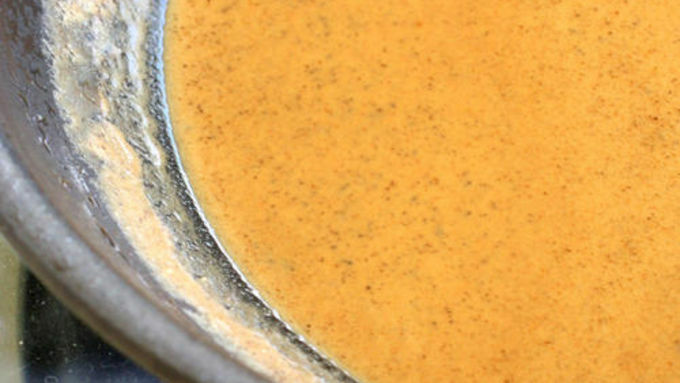 Continue cooking 6-7 minutes, stirring constantly, until roux becomes a caramel color. Be careful not to burn but the darker the roux the deeper the flavor. Add the roux to the chicken stock mixture and bring to a boil stirring constantly. Reduce heat; add the chicken and simmer. At this point the gumbo is ready to eat but you can let it simmer for 1-2 hours to let the flavors meld even more if you wish. You can also pour the gumbo into a crockpot on low until you are ready to eat. Add the shrimp right before serving. Serve with a scoop of rice or over rice. You can use file powder instead of okra to thicken and flavor this gumbo. Just add 2-3 tablespoons to the pot at the same time you add the shrimp before stirring. Nothing beats a great cup of gumbo, New Orleans style. 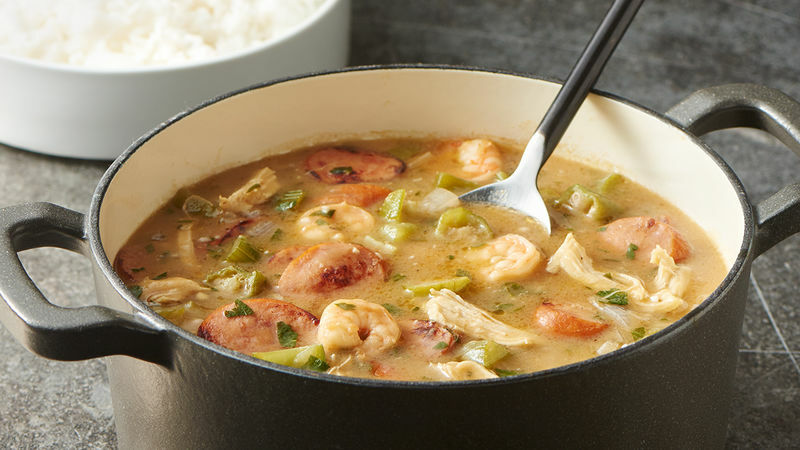 This Sausage, Chicken, and Shrimp Gumbo is a traditional version of the famous Southern dish. Although gumbo comes in all shapes and forms, there are usually a few common factors that identify a gumbo as a gumbo. Just like its Cajun sisters, jambalaya and étouffée, gumbo usually starts off with a base of chopped onion, green bell peppers, and celery. This trio of vegetables is known as the “holy trinity” in the South. Gumbo is also usually thickened with a roux and either okra or filé powder (this version uses okra). While there are no rules, here are three tips to an impressive gumbo: 1.) The darker the color of the roux, the deeper the flavor. While you’re making your roux, try not to be simultaneously watching your favorite reality show or texting your friends. This requires your full attention! There’s a fine line between a beautiful dark colored roux and burnt roux. And once it’s burnt, there’s no going back. Time to start over. 2.) Brown your meats. This is a simple step that adds so much flavor to your gumbo. 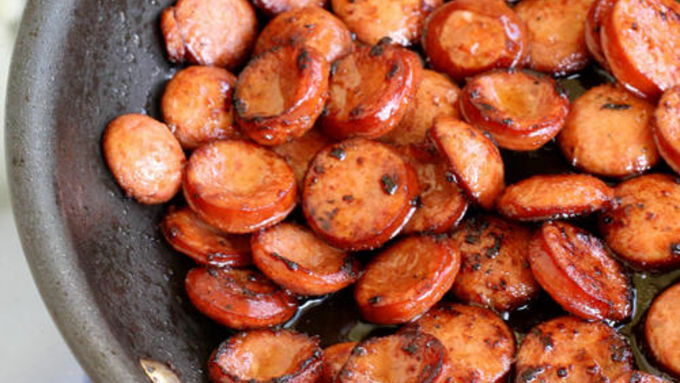 There’s nothing worse than biting into a soft piece of flavorless sausage. But biting into a crisp piece of sausage with caramelized edges ... yum. 3.) Make it your own. If you don’t like shrimp, don’t put it in. If you like it with a kick, add some hot sauce. This is your gumbo! My husband likes sausage, chicken, and shrimp in his gumbo with some added heat so that’s how we make it in my house. 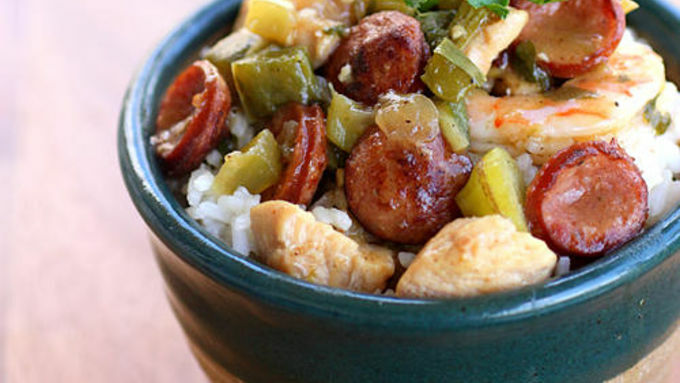 Mardi gras is the perfect occasion for a big bowl of gumbo served over steamy hot rice!